← Somar Has Been Nominated For an Indie! We celebrated our 1-year anniversary on March 31st with a “thank you” party. We are grateful to Oakland, Uptown, friends, family and neighbors for making our first year a great one! The party started at 4 pm with food from the neighborhood – we even had a roasted whole pig – and complimentary wine and Somar Fizzes. Next came a wonderfully rich chocolate cake and gift bags. We had a great turn out and hope every one had a good time. If you couldn’t make it, check out the photos. And if you were there, maybe the camera caught you having fun! If you’d like to share photos you took, send them to info@somarbar.com and we’ll post them. Thanks. 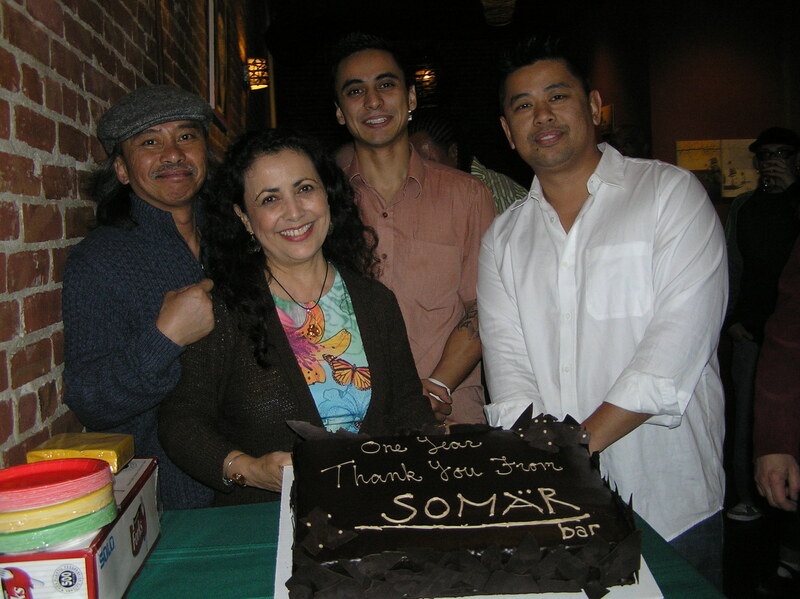 This entry was posted in Events, Photos, Somar Family and tagged anniversary, Somar. Bookmark the permalink. Hey Somar folks! Congratulations on your 1-year anniversary — it’s ours too this month! Love your place and will be visiting for years to come. Hope the sushi love comes back! !